As the two-part finale of Twin Peaks approached, I briefly looked back over the recap columns I’d written over the summer. Mostly, I was struck by a wish that I could have had more time to polish and edit each one, wincing at the forced prose hammered out as quickly as possible each Sunday night while I was still reeling from the show’s revelations. One happy accident I noticed was the way the column shifted from a vague description of how it felt to watch the show into a more concrete dissection of the plot. Without meaning to, I had sort of captured the particular way Lynch and Frost’s story revealed itself, the way the act of watching dissolved as the shape of their visions came into focus. Now, at the end, I find myself returning to a place of abstraction. I can try to recap what I’ve just seen, but a summary can’t fully convey what it was all about. “For twenty-five years, I’ve kept something from you,” David Lynch himself says at the beginning of the end of Twin Peaks. He’s playing Gordon Cole talking to Albert Rosenfield, but he’s also himself talking to us. This is the ending (or endings?) he’s been waiting to give us for so long. Cole reveals that, before they disappeared, Dale Cooper and Garland Briggs told him they were on the trail of “an extreme negative force” known as Judy, and that Cooper was trying to “kill two birds with one stone”. This conversation is interrupted by a call from the Vegas F.B.I. agents with the message Dale left with Bushnell Mullins, which directs the Blue Rose Task Force to meet him at the Twin Peaks Sheriff’s Station. Cooper’s doppelganger arrives at the station first, but only after the Fireman and the head of Major Briggs deposit him there upon his attempt to enter the White Lodge. He nearly fools the team inside into believing he’s their long-lost friend, but a call from the real Dale tips off Lucy, who finally understands cell phones enough to take out the evil Coop with a gunshot. All of our heroes converge in time for an action showdown between Freddie’s superpowered fist and the essence of Bob that emerges from Doppel-Coop’s corpse. The ghost is vanquished, the double is banished to the Black Lodge, and Naido turns out to be Diane in some sort of false shell. The real Dale and the real Diane, truly reunited at last, kiss passionately. Special Agent Dale Cooper looks around at all his friends and has a sudden realization. The image of his face, just after Laura Palmer whispered in his ear in Part 2, fills the frame and mutters, “We live in a dream.” Cooper asks Sheriff Truman for the key to his old Great Northern room (which he’s had since Ben Horne gave it to him to give to Harry) and leads Gordon and Diane to that strange humming door in the hotel’s basement. Dale instructs his partners not to follow him through the door, and reassures them he’ll see them “at the curtain call”. On the other side of the door, Mike greets Dale with a recitation of the “Fire Walk With Me” poem, before taking him to see Phillip Jeffries. Dale asks about February 23rd, 1989, the night Laura Palmer was murdered. Jeffries hints that Judy can be found there, and transports Dale into the final scenes of Fire Walk With Me with a cryptic plea to “remember”. Lynch replays the moment that Laura abandons James and runs into the woods to meet with Leo, Jacques, and Ronette, but now, Dale is there to intercept her. She recognizes him from her dreams, and takes his hand as he offers to bring her home. The Twin Peaks pilot begins, but without Laura’s corpse washing up on the beach. Pete has a pleasant morning fishing, Josie goes on about her day, and Catherine’s business schemes continue unabated. But it doesn’t work. In the present, an anguished Sarah Palmer takes her grief out on Laura’s photo, stabbing it repeatedly to no avail. Dale leads Laura through the woods, but her hand disappears from his, and she’s gone. Somewhere in the distance, she screams. Dale Cooper listens to the wind blowing through the trees, and knows he can’t stop Laura Palmer’s death. In the Roadhouse, Julee Cruise sings “The World Spins”, the song she once sang as Cooper accepted his failure to save Maddy Ferguson. Part 17 of The Return ends, and the story of Twin Peaks draws to a close. But there’s an epilogue. After Laura’s whisper, a version of Dale Cooper emerges from the Black Lodge to find Diane waiting for him. Together, they drive 430 miles away, to a place where electricity hums through lines along the highway. Knowing that things might soon be different, they cross into another plane and find a motel to stop for the night. Diane spots a doppelganger of her own, but says nothing as she and Dale share a night of passion set to The Platters’ “My Prayer”, a song Lynch has tied in our memory to the world-altering events of Part 8. While they make love, Dale seems to completely dissociate, and later wakes to find Diane has vanished, leaving only a note addressed to a Richard from a Linda. Cooper leaves a different motel than the one he checked into, and drives through the town of Odessa, Texas, until he finds himself attracted to a diner called Judy’s. There, he rescues a waitress from some abusive patrons and demands the address of the other waitress who works there. This leads him to a woman he is certain is Laura Palmer, though she denies it, identifying herself as Carrie Page. Carrie has a dead man in her house, and is eager enough to escape her seeming myriad of troubles that she agrees to accompany the agent to the town of Twin Peaks. They set out on a long road trip, Carrie almost-but-not-quite getting confessional about her misspent youth. They arrive at last, passing the Double R, which is missing the “RR to Go” branding it’s had throughout the season, as if it hasn’t progressed after all. Carrie claims not to recognize the Palmer house, but Dale anxiously knocks on the door, eager to give Sarah her daughter back. But Sarah’s not inside. The woman who answers the door introduces herself as Alice Tremond, and says she bought the house from a Mrs. Chalfont. Dale staggers away from the Palmer house, disturbed, perhaps remembering the Tremond/Chalfont specters who have inhabited the empty spaces around his previous investigations. He has a sudden realization, demanding to know what year it is. It is then that Carrie Page hears the voice of Sarah calling for her dead daughter, and screams the horrified scream of Laura Palmer as the house goes dark and our vision goes black. As the credits roll, David Lynch lets us linger on that moment of Laura whispering a secret in Dale’s ear, the moment where possibilities diverged. The “return” of Twin Peaks: The Return carried many meanings before its final two hours played out, but this epilogue provides the most thematically significant return of all. Lynch and Frost’s return to the story of Twin Peaks and Dale Cooper’s return to the waking world have brought us in contact with a tapestry of characters coping with the weight of the years since we saw them last. Some are haunted by regret, some are caught in cycles of mourning, some are struggling to avoid the fates of those who came before. All of them have a piece of their past they wish they could change. Dale is offered the chance to return to a lost moment and undo the greatest tragedy of all, the murder that set his journey in motion twenty-five years ago. But he learns that he absolutely cannot. To remove one piece of a life story leaves an unrecognizable nightmare of paradoxes and issues left to fester until they rot away everything we once knew. 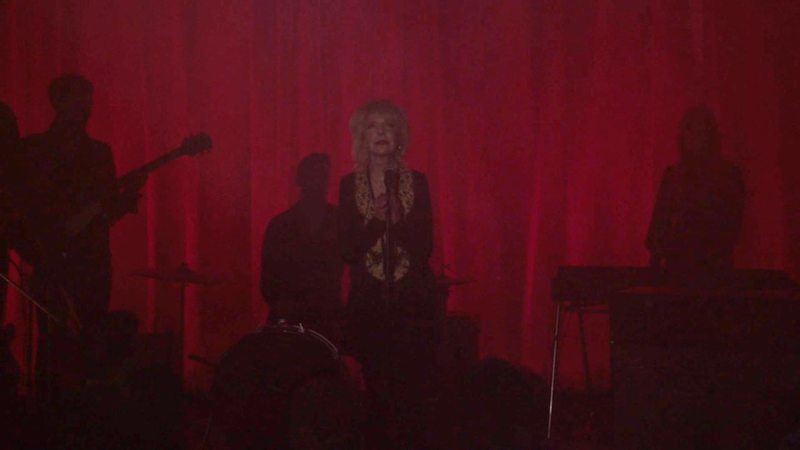 “Shadow”, the Chromatics song that closed the two-part premiere, set the tone for the series, but feels more relevant now than ever, with lyrics like “I took your picture from the frame/And now you’re nothing like you seem.” Cooper was released from Black Lodge stasis, Laura was ripped from the black-and-white facts of her story, and Twin Peaks broke free of what it had been before and bloomed into something new. David Lynch and Mark Frost seized the chance to capitalize on our nostalgia, and used it to push us forward. The past dictates the future, our country’s history shaped our present, and each thing that happens to us does its part to make us who we are. What’s been published can never really be edited. Stories are formed by outside forces, like the cancellation and revival of a television show. We can never have things back exactly as they were, just as we can’t save the people we love by erasing their loss. The most powerful thing we can do is to go forward, into the future, and remember.